When a stimulus causes backward nerve transmission, vasodilation of the innervated blood vessels occurs; this is the axon reflex, also referred to as the flare response. An impaired axon reflex indicates peripheral neuropathy. In practical terms, when skin is heated (by using the moorVMS-HEAT) or iontophoresed (by using the moorVMS-ION) with acetylcholine over a well defined area, microvascular blood flow also increases in the surrounding skin (as well as at the site stimulated). Laser Doppler monitoring (moorVMS-LDF) is used to assess the magnitude and time course of the vasodilation, and additional information on the flare area can be obtained with laser Doppler (moorLDI2) and Speckle imaging (moorFLPI-2). 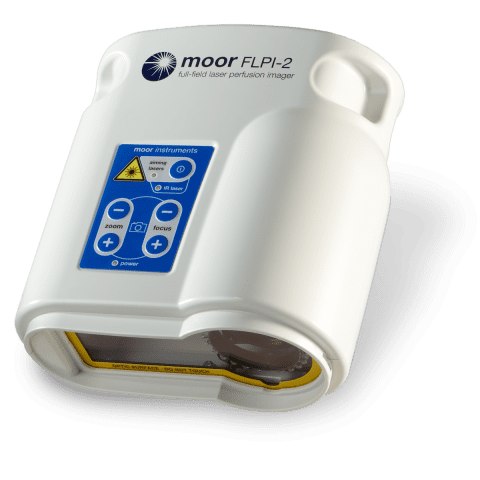 The moorFLPI-2 with high speed and spatial resolution is the system of choice, coupled with moorVMS-ION iontophoresis and ION6 chambers + CAP. Ahluwalia P, McGill J I, Church M K.
Nedocromil sodium inhibits histamine-induced itch and flare in human skin. British Journal of Pharmacology. 2001, 132, 613-616. Bickel A; Kramer H H; Hilz M J; Birklein F; Neundorfer B, and Schmelz M.
Assessment of the neurogenic flare reaction in small-fiber neuropathies. Caselli A, Rich J, Hanane T, Uccioli L, and Veves A.
Krishnan STM and Rayman G.
The LDIflare: A novel test of C-fiber function demonstrates early neuropathy in type 2 diabetes.